I wanted to start the month with a recipe. The weather here was warm this week, but today is back to winter and a warming Jambalaya is a perfect pick me up of rich flavors and hearty broth that can shake away the I-Am-Done-With-Winter feeling that seems to spread this time of year. I love Jambalaya because it is generally a one pot meal perfect for the family. And fancy enough to serve to company. 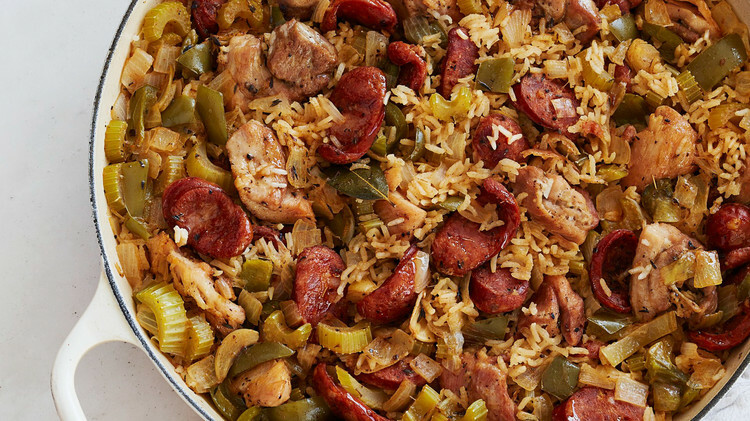 Don’t confuse Jambalaya with Gumbo. Gumbo is a stew or soup that is traditional in Louisiana – it is almost always made with a roux to thicken the broth. In Louisiana every family has their own unique gumbo recipe. 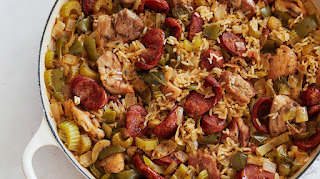 Jambalaya on the other hand is a rice-based dish which is usually made in one pot. It is considered by some to be a Cajun cuisine. Originating from the French-speaking Acadian or “Cajun” immigrants deported by the British from Acadia in Canada to the Acadiana region of Louisiana. 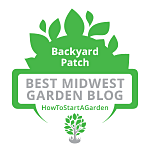 It is what could be called a rustic cuisine — locally available ingredients predominate, and preparation is simple and many time one-pot. To make the best Jambalaya you need a heavy bottom Dutch oven. We got a small food network one a few years ago and my husband realized he had never really cooked until he had a Dutch oven. We soon needed a larger one, so as a gift I got him a bigger gray one. Now armed with this and kosher salt, my hubby can cook anything! We are going to start with a traditional Louisiana Jambalaya and then over the month branch into different variations on the Jambalaya theme. This one does take some time, as you are going to make the chicken stock and cook the chicken as step one, then make the other parts which go a bit faster. 1lb smoked sausage (sliced) Andouille if you can get it. In a large pot, cover chicken with water and add the celery, quartered onion, and the 4 cloves of garlic. Boil until tender, approximately 1 hour. Reserve the stock. Remove the chicken from the bones & either cut, slice, cube or shred. In 5 cups of stock, cook rice until liquid is absorbed, about 25 minutes. The rice should be slightly moist. In a Dutch oven, sauté the sausage and ham until slightly browned, about 3 to 5 minutes. Remove the sausage and ham from the Dutch oven and set aside. Add butter to Dutch oven and sauté the chopped onion, green bell pepper and parsley until tender, about 3 minutes. Into the Dutch oven, add the chicken, sausage, ham, the 2 cloves of minced garlic, tomato paste, bay leaf, thyme, salt and pepper. Mix, and then add the rice and the cooked shrimp and mix thoroughly. Cook over low heat, stirring constantly, about 15 minutes. Remove bay leaf and serve.